For over twenty years, Wendy and Harry have been designing and producing contemporary studio glass and selling it nationally and internationally to fine craft galleries, museum shops, and directly to customers. All of the glass is designed and blown in Hardwick, Vermont, using traditional, contemporary and innovative glass blowing techniques. 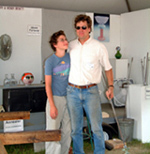 Harry, currently President of the Vermont Craft Council, had the opportunity early in his career of working with two of the world's most innovative glass artists- two years with Asa Brandt of Sweden, the first independent studio glass artist in Europe and three years with Josh Simpson of Massachusetts, a prominent American studio glass artist. Winning awards (such as the North American Glass Biennial Best of Show), honors (such as exhibiting glass at and being invited to the White House three different times) and participating in many national exhibitions, Harry continues the tradition of his mentors in making objects in glass that reflect a unique and personal vision combined with a deliberate sense of style and beauty. Wendy, with a BFA in Ceramics, contributes to the design and development of all the work, while also handling all the necessary aspects of keeping a business running. Recently added studio space has created an environment in which her skills as a ceramicist and painter have been able to flourish away from the hectic tumult associated with the glass shop. In addition to a full line of functional glassware, Wendy & Harry are currently making work which combines landscape painting with blown glass forms. 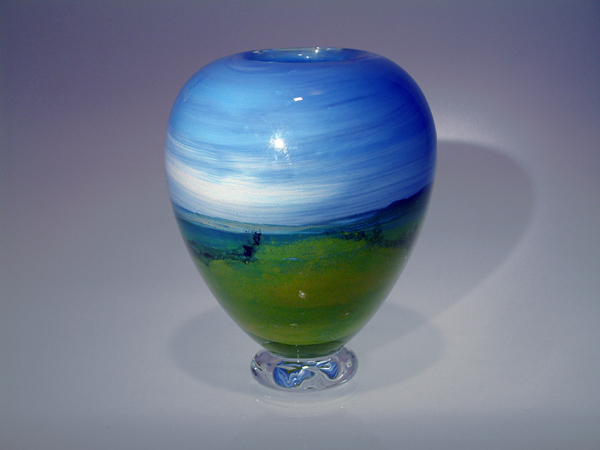 Each piece captures our Vermont landscape and encases it in glass. The images are subjected to the movement and distortion inherent in shaping molten glass, creating a magical world so familiar to those fortunate enough to know the northern New England landscape. Born Baltimore July 19th, 1957. Harry and our son Jonathan at our demo booth at Sunapee. View of our house and grape arbor. 1984-Present: Independent Glassblower, first in East Alton NH ("East Alton Glass Workshop" 1984-1988), then (and still) in Hardwick, Vermont (Vermont Glass Workshop). Nicholas Cloutier, Wendy Besett, Ken Burris, Aaron Warkov, Jose Benitez, Susie Cushner, Len Mastri, *For details ask Harry. Born Northborough, MA Dec. 14th, 1960. BFA Ceramics, UMass, Amherst 1983. Studied at Folketskolan in Eskilstuna, Sweden, 1983.